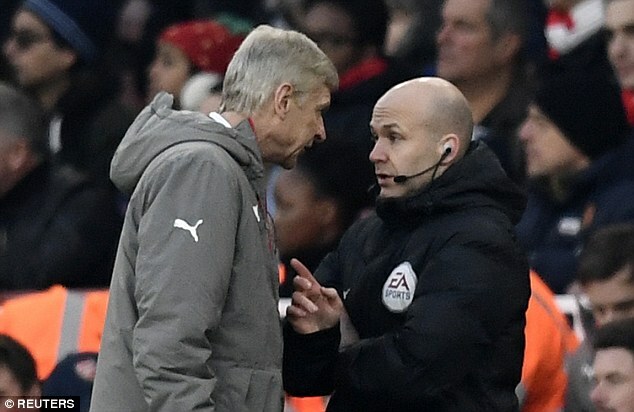 Arsene Wenger could face a lengthy ban from the Football Association, despite apologising for arguing and pushing fourth official Anthony Taylor during Arsenal’s dramatic 2-1 win against Burnley yesterday. 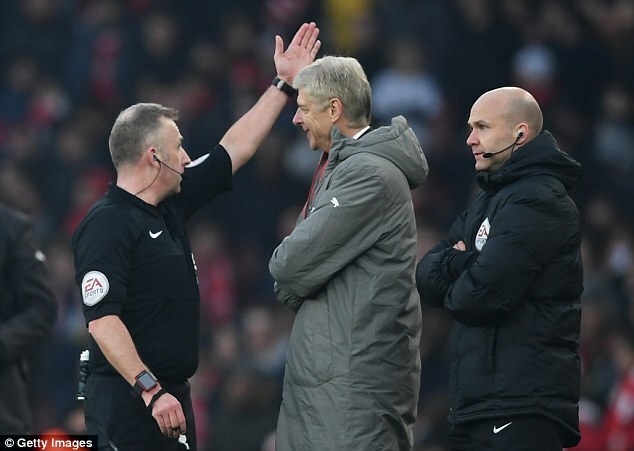 Arsenal’s manager was livid when Burnley were awarded a stoppage-time penalty to equalise at the Emirates Stadium and it saw the 67-year-old sent off by referee Jon Moss. 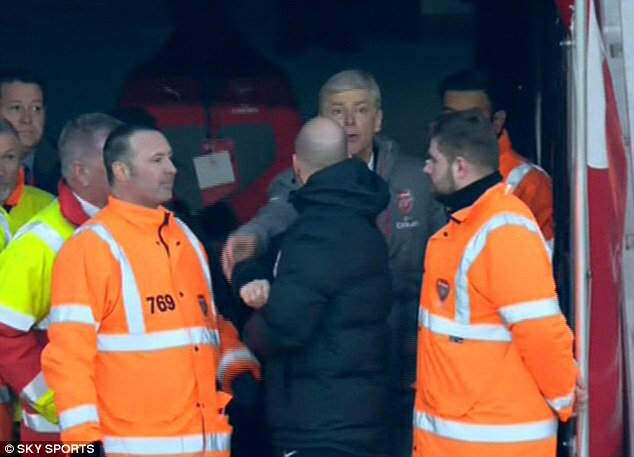 Wenger then stood in the tunnel to watch the closing moments of the match but was told he had to leave by Taylor. 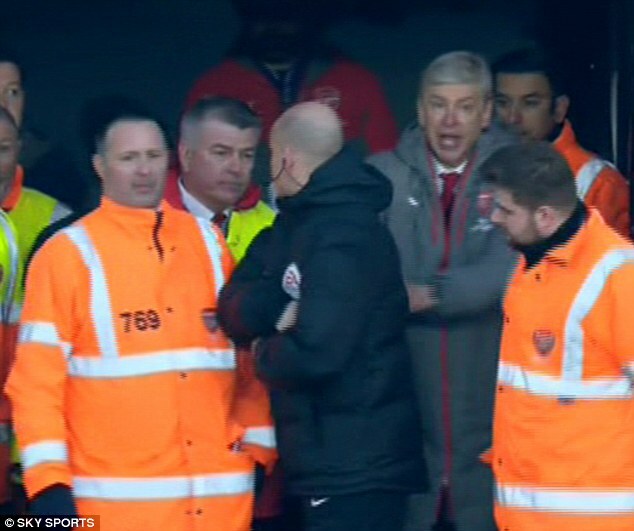 The Frenchman shoved the fourth official twice as stewards stood between them. The Gunners, who also had Granit Xhaka sent off for a two-footed foul, won it in the eighth minute of stoppage time through a ‘Panenka’ penalty by Alexis Sanchez. But the last-gasp award was also controversial as Laurent Koscielny was offside when he challenged for a Sanchez cross and was caught by Ben Mee’s high kick. The FA will wait to see the referee’s report regarding Wenger’s dismissal before deciding on any action. Wenger said: ‘I thought I could watch it from the corridor [of the tunnel]. I regret everything. I should have shut up, gone in and gone home. I apologise for that. ‘Look, it was nothing bad. I said something that you hear every day in football. Overall nine times out of ten you are not sent to the stands for that. Wenger said in his post-match press conference that he had not yet spoken to Taylor to say sorry in person. Sky pundit Graeme Souness, meanwhile, thinks Arsenal’s manager will be in trouble with the FA. Burnley boss Sean Dyche felt Arsenal should never have been awarded the last-gasp penalty. ‘You just can’t do this,’ said Souness. ‘He has obviously not gone far enough into the tunnel and [the fourth official] has asked him to go further back. Burnley boss Sean Dyche was more concerned at the final penalty awarded against his side. ‘It is a tough day for us,’ he said. 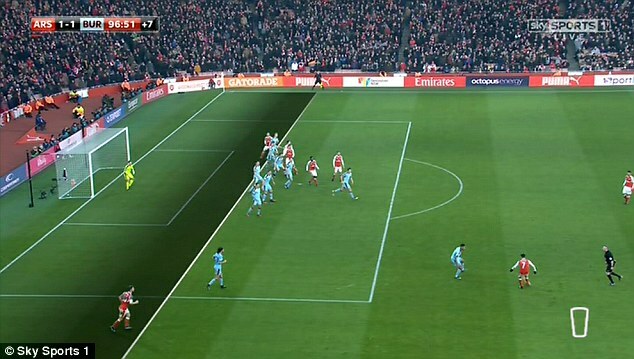 ‘To lose a game in that fashion, with an offside not given, is tough. We never take anything for granted. We know how tough this division is but you need officials to make the right decisions and that is the shame today. Shkodran Mustafi’s header gave Arsenal the lead in the 59th minute before Xhaka was sent off for a scissors tackle on Steven Defour in the 65th. Burnley equalised in the 93rd through Andre Gray after Francis Coquelin’s foul on Ashley Barnes. Sanchez was not Arsenal’s first-choice penalty taker but, with Olivier Giroud having been replaced by Danny Welbeck, the responsibility fell to the Chilean.